The Sacrament of the Anointing of the Sick is for anyone who is facing a serious or chronic illness. It is not intended only for the dying. 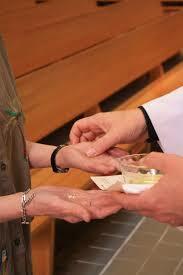 It is recommended that the sacrament be received before the patient is near death. The sacrament can be a time of peace in asking for God's blessing during the time of illness or in preparation for surgery. If you or your loved one is in a hospital please check with the pastoral care office for a Catholic chaplain to administer the sacrament. If the patient is home bound or able to get to church, arrangements can be made through the parish office - 301-447-2367 .